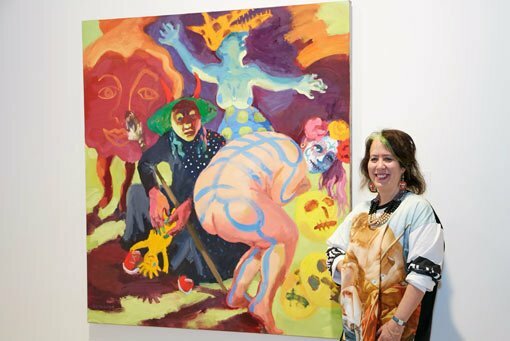 Women artists have scooped the pool in this year’s competition, taking out the Archibald, Wynne and Sulman Prizes as well as the Trustees Watercolour Prize and the Packing Room Prize – and all are first-time finalists. Five sisters from the Ken family – Tjungkara Ken, Yaritji Young, Freda Brady, Maringka Tunkin and Sandra Ken – received the Wynne for their collaborative canvas, which tells a ‘seven sisters’ story about family protecting and teaching each other. 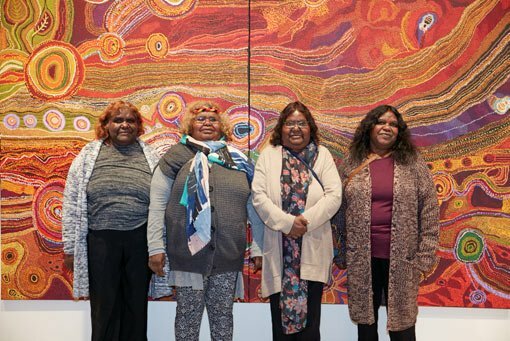 Four of the sisters were at the Gallery for the opening, having travelled to Sydney from their remote Aboriginal community of Amata in the Anangu Pitjantjatjara Yankunytjatjara Lands in the far north-west of South Australia. 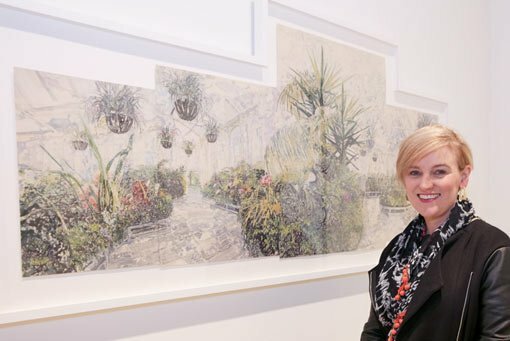 Finalists in the Wynne Prize are also eligible for the Trustees Watercolour Prize, which on Friday was presented to Leah Bullen for her work Conservation no 2 . 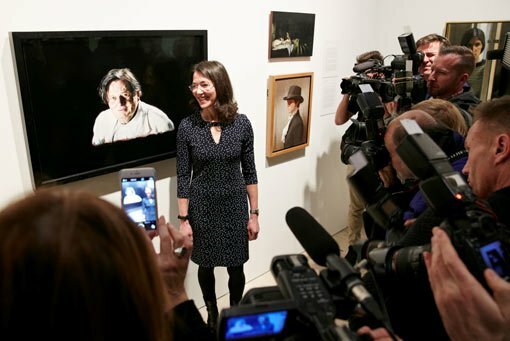 And all entrants in the Archibald have the chance of winning the Packing Room Prize. 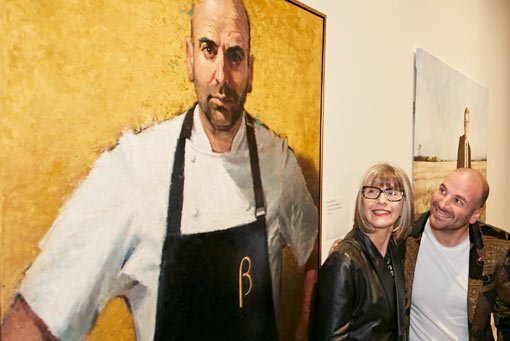 This year it was Betina Fauvel-Ogden’s portrait of George Calombaris that caught the eye of Gallery staff who receive and unpack all the entries as they arrive. Overall, women made up 422 of the 830 Archibald entrants (and 25 of the 51 finalists), 360 of the 710 Wynne (9 of the 34 finalists) and 254 of the 533 Sulman (10 of the 25 finalists). 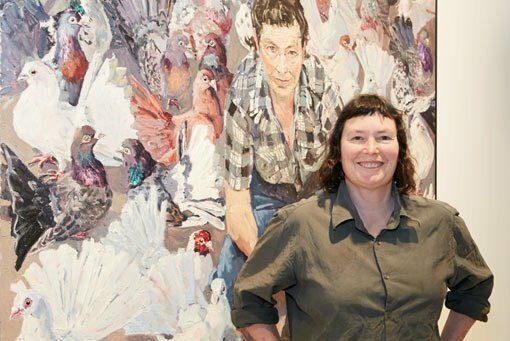 One artist – Lucy Culliton, a regular in the competition – took out the finalist-trifecta with works in each of the Archibald, Wynne and Sulman and she was highly commended for her Wynne painting. It’s the first time in the history of the prizes that they have been won by women only. In 1986, which predates the Packing Room Prize, Davida Allen won the Archibald, Rosemary Madigan won the Wynne, Wendy Sharpe won the Sulman and Suzanne Archer won the Trustees Watercolour Prize, but two works shared the Sulman, with Nigel Thomson the joint winner. Thirty years later, Wendy Sharpe is back in the 2016 exhibition. After being in one Wynne and six Archibald exhibitions (including a win in 1996), this is her 11th time as a Sulman finalist. And while you’re here, you might like to go on our self-guided tour I am woman to see the work of some other pioneering women artists around the Gallery.